Schools do not define education, and they are not the only institutions in which learning takes place. After-school programs, music lessons, Scouts, summer camps, on-the-job training, and home activities all offer out-of-school educational experiences. 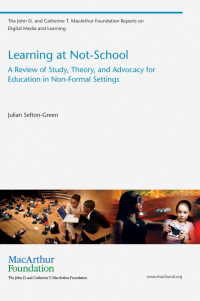 In Learning at Not-School, Julian Sefton-Green explores studies and scholarly research on out-of-school learning, investigating just what it is that is distinctive about the quality of learning in these “not-school” settings. Sefton-Green focuses on those organizations and institutions that have developed parallel to public schooling and have emerged as complements, supplements, or attempts to remediate the alleged failures of schools. He reviews salient principles, landmark studies, and theoretical approaches to learning in not-school environments, reporting on the latest scholarship in the field. He examines studies of creative media production and considers ideas of “learning-to learn”-that relate to analyses of language and technology. And he considers other forms of in-formal learning–in the home and in leisure activities–in terms of not-school experiences. Where possible, he compares the findings of US-based studies with those of non-US-based studies, highlighting core conceptual issues and identifying what we often take for granted. Many not-school organizations and institutions set out to be different from schools, embodying different conceptions of community and educational values. Sefton-Green’s careful consideration of these learning environments in pedagogical terms offers a crucial way to understand how they work. Julian Sefton-Green is a Principal Research Fellow in the Department of Media and Communications at the London School of Economics and Political Science, University of London.